top row: green mango salad, "green legs" green mango and dalandan shake, corned beef brisket sinigang, grilled galunggong (mackerel scad), all from sentro; rogan josht and vegetable biryani from bollywood. second row: steamed seafood curry, sticky rice and mango, prawns wrapped in vermicelli, and lemongrass and ginger cooler from people's palace. third row: pako fern salad with salted duck eggs, lengua, bicol express vegetables in coconut milk from abe's. fourth row: fresh lumpia ubod (heart of palm wrapped in crepes), lumpia filled with a spiced garbanzo mixture, from abe's. kani crab and lettuce salad, tofu steak with brown enoki mushroom and spinach from sugi. top row: lampone raspberry sorbetto, stracciatella chocolate chip gelato, nocciolo hazelnut gelato from gelatone by pagliacci; kaffir lime, labuyo chili pepper dark chocolate, and orange pandan creme brulees from m café; custard tarts from lord stow's bakery; ping pong cocktail with lychee fruit, passionfruit juice and absolut vodka, vanilla ice cream with shots of espresso and amaretto and biscotti, from people's palace. second row: muesli with fresh mango and banana, tarragon ice tea, chocolate ensaymada, sophia sugar-free chocolate mousse dessert, chocolate soufflé with vanilla ice cream and orange sauce from bizu. third row: chicken with cashews, fried prawns, assorted dim sum, and sautéed asparague from president. fourth row: artichoke and spinach fondue, hummous (chickpea), tzatziki(yogurt/cucumber), melitzanosalata (roasted eggplant/tomatoes), and htipiti (roasted pepper/feta) dips, greek salad and chicken shishkebab from cyma estiatorio. fifth row: one tea of many, assorted dim sum (including very good xiao long bao soup dumplings, pineapple fried rice from zhongnanhai chinese bistro. 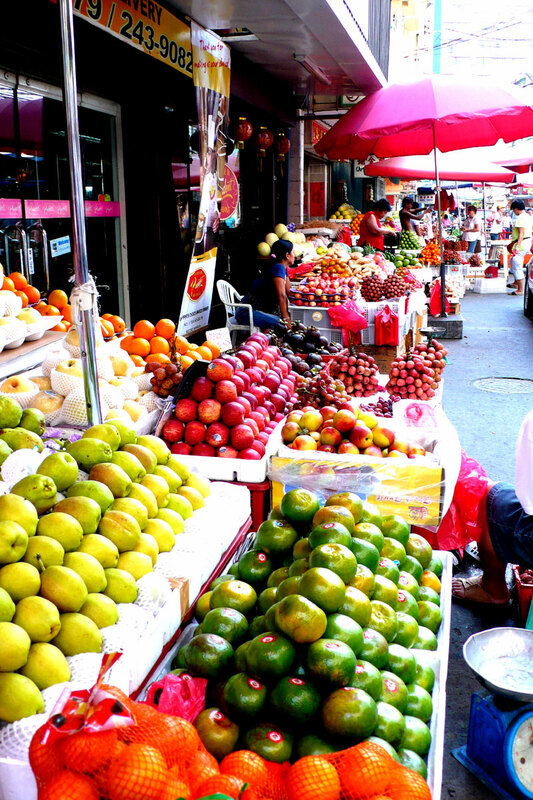 fruit vendors, binondo, manila, philippines. 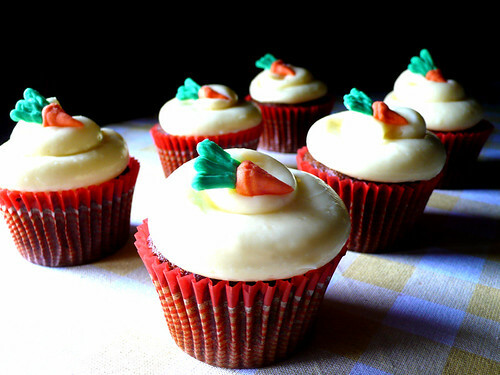 the barefoot contessa's carrot cake cupcakes. carrot cake cupcakes with a cream cheese frosting, from my most favourite member of the ford and carter administrations, ina garten (office of management and budget, 1974-78). 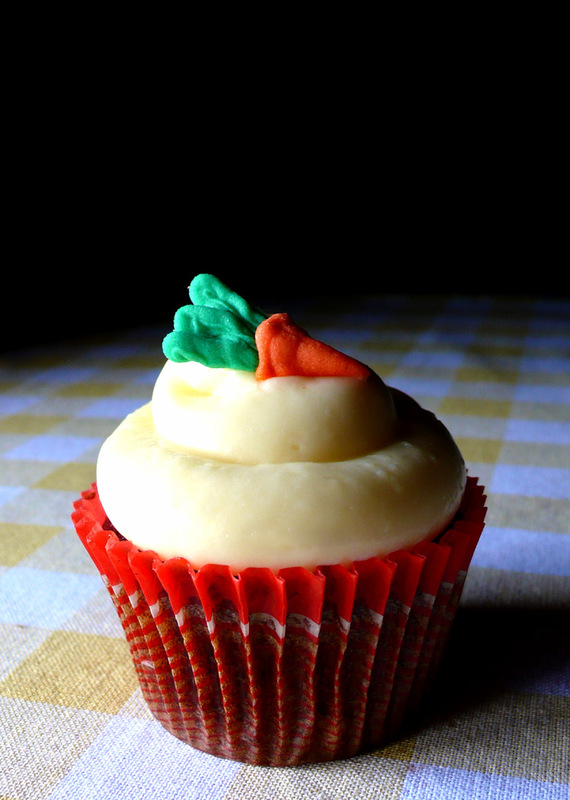 they were good--moist, spicy, good balance of sweet frosting to not-so-sweet cake, but i didn't find these carrot-y enough, even though i added an extra cup of grated carrots more than the recipe called for. however, they made a darn tasty spice cake. if you decide to try these, be careful with the cooking time--the 10 minutes at 400˚F then 35 minutes at 350˚F was excessive; i'd go with 25 minutes at 350˚F all the way, or the prescribed 10 @400˚F, then 10-15 minutes at 350˚F. use your intuition or the force, young cupcake warrior, and the cake universe will be yours. i was a little upset when the little mom and pops store in front of ypao beach in tumon closed down; it was one of the few truly local touches in the mostly touristy part of town. i am however, appeased by the fact that the restaurant that took over the space, proa, is locally owned and operated, and features island-inspired food. also, proa (btw, the name comes from a type of sailing vessel) took what was a rather dark and dingy space, and made it over into a lovely, bright yet calm dining room. the menu is quasi-continental with a guam touch; i don't really know what that means, but it sounds better than it's sort of american, it's a little european, it's not really asian, and there are things about it that really guamish. 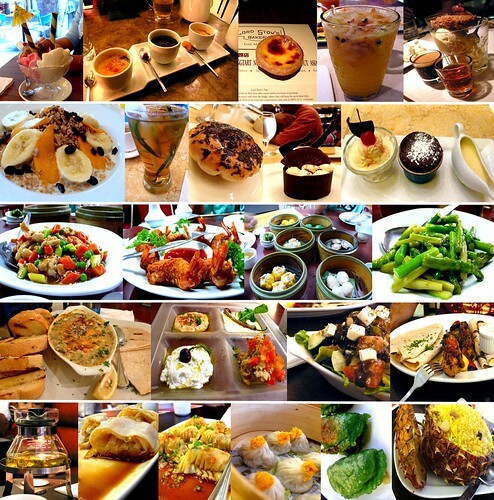 truthfully, a cursory glance at the menu yields nothing too adventurous or exciting--the pay-off is in the execution. everything is expertly prepared, plated well, fresh, tasty, and consistently so. 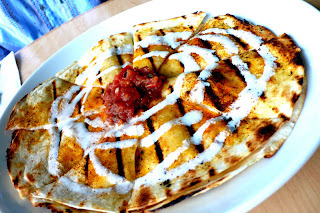 we started with the soup of the day and barbecued chicken quesadilla with roasted tomato salsa and buttermilk ranch dressing. i was a little wary about this because i'm not a big fan of ranch dressing, especially if it's a commercial prepared product. however, the grilled quesadilla had a good amount of lean chicken and not so lean cheese within, and although the amount of tomato salsa given was meager, it packed quite a bit of flavour. the dreaded ranch dressing was very light--it seemed more like a lightly spiced crema than salad dressing, and it helped to lighten and cool the dish. the soup that day was pumpkin which had a nice full-bodied flavour of squash, but without a heavy creaminess; perhaps made with pureed pumpkin and some sort of stock instead of relying on a lot of dairy product. on one occasion, we tried two of the three sandwiches on the menu: a soft-shell crab in a cornmeal crust, and a sirloin beef burger with mozzarella and fried egg. 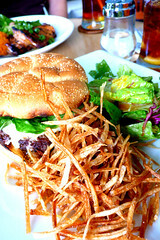 both were served with a mixed green salad and a generous amount of house-made shoestring potatoes, which were lightly salty and exceedingly tasty. crunchy, not too greasy, addictive. the soft-shell crab was a little overwhelmed by the cornmeal crust, but the crunch was a nice foil to the creamy crabby innards and soft kaiser roll. the burger was very good--beefy, moist and tender, with the flavour enhanced by a bit of runny and sunny egg yolk and buttery melted mozzarella. 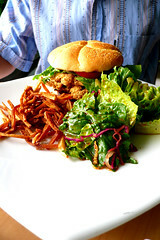 a good portion of the menu is devoted to barbecued/chargrilled items: the burger, chicken, ribs, and shortribs. 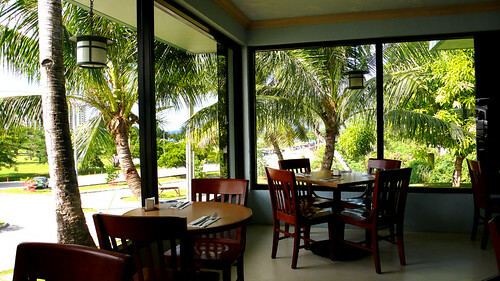 island-style barbecue is a relatively simple process of marination in a soy sauce-based marinade and a reliance on charcoal or wood, not gas. 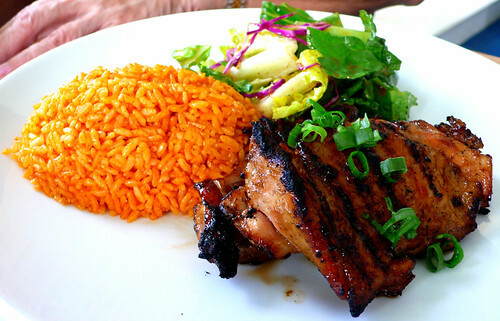 proa does a very good job of chargrilling items; the meat is tender, not overpowered by the marinade, and smoky, not burnt tasting. 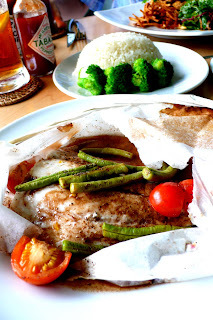 there is only one fish entree, a steamed fish with green beans, tomatoes and balsamic dressing in parchment that is light and tasty, but in order for me to think of proa as a more "pacific rim" type restaurant, i'd like to see more fish and seafood options. 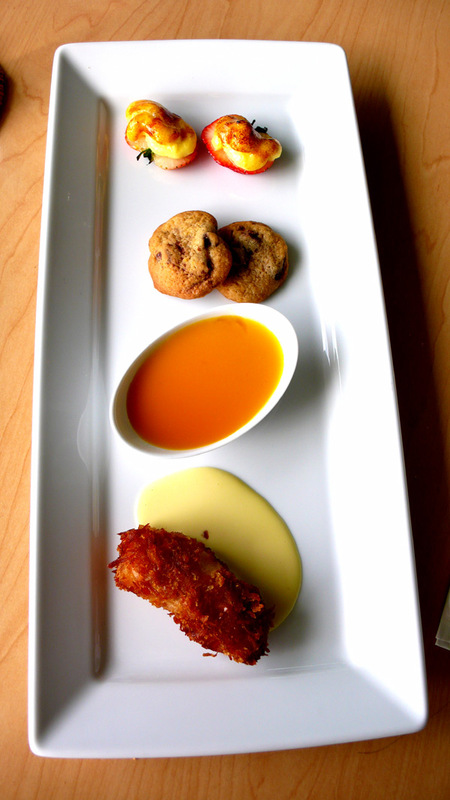 also, i'm told they will be opening up a bakery, but there is only one official dessert on the menu, a tasting plate with strawberry creme brulee, orange chocolate chip cookies, panna cotta with a mango sauce, and a coconut encrusted banana fritter. the strawberry brulee is particularly appealing--a fresh strawberry is halved and topped with a dollop of custard and sprinkled with sugar, then either run through a broiler or blowtorched until the sugar caramelizes in a thin, brittle crust. it is obviously not the standard ratio of dairy to fruit, but i like the berry's advantage: a nice combination of fresh and sweet, crisp and juicy. the panna cotta and banana add more tropical goodness to the plate and are much lighter on the stomach and palate than one might think, but there is an odd commercial? artificial? flavour to the chocolate chip cookie; however, they are so small that it's not that offensive. proa opened late last year, and it seems to be quite popular already. 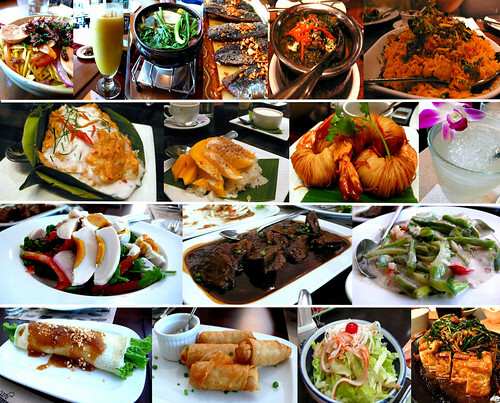 the prices are very good (most entrees are under $10), the quality and service are consistently good. i look forward to seeing this little restaurant establish itself as a true local spot on the tourist track.